Owen is a trial lawyer and litigator in the Firm’s Litigation and Motor Vehicle groups. He has significant first-chair experience—from pre-litigation counseling through trial and appeals—representing large corporate clients in a wide range of commercial disputes. These disputes have involved antitrust, securities, regulatory, contract, and tort claims. Owen’s clients include motor vehicle manufacturers, distributors, and captive finance companies, banking and financial institutions, and commercial real estate developers, among others. Owen has a strong track record of success at trial but aims to achieve his clients' goals with an efficient, business-first approach to litigation. 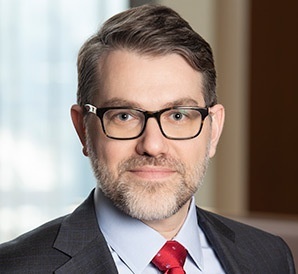 Owen maintains a national practice, litigating in federal and state courts, administrative agencies, and arbitrations throughout the U.S. Before joining the Firm, Owen practiced law at Sidley Austin LLP in New York, where his practice focused on antitrust and securities litigation. Since joining the Firm, Owen has frequently counseled and litigated on behalf of automobile, motorcycle, and powersports manufacturers and distributors, as well as captive finance companies, in industry-specific dealer network matters. This includes buy-sell transactions and rights of first refusal, establishments and relocations, terminations, incentive programs, facility programs, sales performance standards, and allocation practices. Lead trial counsel for both a luxury import brand and a volume import brand in multi-jurisdiction (federal and state) litigation regarding a dealership group buy-sell transaction and manufacturer rights of first refusal. Defended multiple actions alleging that manufacturer incentive programs violated federal and state antitrust laws. Represented manufacturers and distributors in several dealer termination actions, including those involving challenges to manufacturer sales performance metrics, incentive programs, allocation and distribution practices, and dealer territories, among other things. Represented manufacturer and distributor in connection with federal and state litigation regarding emissions defeat devices. Advised manufacturers and distributors on the structuring and implementation of national incentive programs. Represented manufacturer and distributor in connection with a dealer’s multi-million dollar warranty and incentive fraud scheme. Negotiated numerous market actions on behalf of manufacturers and distributors, including pre-litigation resolution of add-point disputes, buy-sell transactions, and facility issues. Owen also maintains an active general commercial litigation practice. He has significant experience litigating antitrust and securities matters, as well as actions involving fraud, breach of contract, tortious interference, and breach of fiduciary duty claims. Defended a large investment bank against claims for conversion, breach of contract, and breach of fiduciary duty relating to securities repurchase (repo) transactions. Represented a “Big Six” book publisher in civil antitrust investigations by federal and state authorities relating to pricing and competition in the e-book market. Defended an international banking institution against claims relating to the bank’s right to charge-back client accounts. Represented an international retail pharmacy corporation in breach of contract and breach of warranty action arising from its acquisition of a medical services company. Defended a large commercial real estate developer against claims relating to the dissolution of a partnership and a joint venture. Defended various financial institutions in securities class actions and direct actions, including issuers, underwriters, and others alleged to have made fraudulent and/or negligent misrepresentations or omissions in connection with the issuance and sale of equity securities, corporate bonds, mortgage-backed securities, and limited partnership units. "Getting the Deal Through - Vertical Agreements 2011,"
"On Life Support for Leeginaire's Disease: Can the States Resuscitate Dr. Miles?"